Islamic State fighters pictured here in a 2014 propaganda video shot in Iraq's Anbar province. 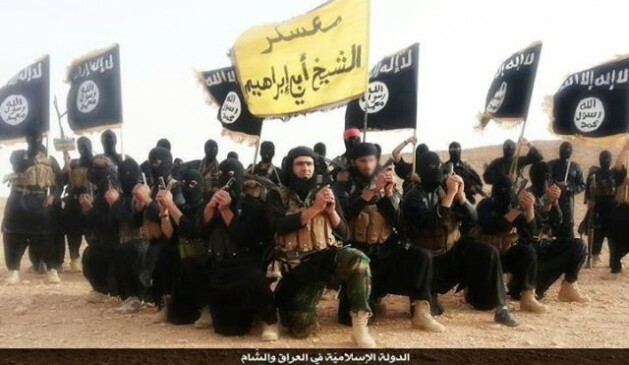 WASHINGTON, Apr 17 2015 (IPS) - More than 25,000 fighters seeking to wage “jihad” or an Islamic holy war have left home to join terrorist networks abroad. The foreign fighters, mostly bound for Islamic extremist groups like the Syria-based al-Nusra Front and the self-titled Islamic State (also in Iraq), come from more than 100 countries worldwide, according to a United Nations report released earlier this month. While the highest numbers are from Middle Eastern and North African countries, Western countries have also seen foreign recruits. Out of the top 15 source-Western countries listed in February by the International Center for the Study of Radicalization (I.C.S.R. ), France, as well as Germany and the United Kingdom have had the highest numbers (1,200 and 500-600 respectively). Only 100 foreign fighters have come from the United States. Why has the U.S. seen such a lower number of recruits compared to its Western European allies? “In this country, the law enforcement authorities have worked much more closely with Muslim communities so that now, some elements within the Muslim community follow the phrase ‘see something, say something,’” Emile Nakhleh, who founded the Central Intelligence Program’s (C.I.A.) Political Islam Strategic Analysis Program, told IPS. “Here, for the most part, Muslims feel they are part of the system and part of the country…they don’t feel alienated,” said Nakhleh, a scholar and expert on the Middle East who retired from the C.I.A. in 2006. While the majority of Muslims worldwide reject violent extremism and are worried about increasing rates in their home countries, American Muslims—an estimated 2-6 million who are mostly middle class and educated—reject extremism by larger margins than most Muslim publics. A 2011 Pew Survey of Muslim Americans, the most current of its kind, found more than eight-in-10 American Muslims saw suicide bombings and other forms of violence against civilian targets as never justified (81 per cent) or rarely justified (5 per cent) to defend Islam from its enemies. That’s compared to a median of 72 per cent of Muslims worldwide saying such attacks are never justified and 10 per cent saying they are rarely justified. Unlike their European counterparts, Muslim Americans come from more than 77 home countries, in contrast with Western European countries where Muslims are mainly from two or three countries. Muslims in America—who make up a smaller percentage relative to the population than their counterparts in France and the U.K.— are also not dominated by a particular sect or ethnicity. A 2007 Pew Survey also found that Muslim Americans were more assimilated into American culture than their Western European counterparts. A majority of Muslim Americans expressed a generally positive view of the larger society and said their communities are excellent or good places to live. Seventy-two percent of them agreed with the widespread American opinion that hard work can help you succeed. Western European Muslims are conversely generally less well off and frustrated with the lack of economic opportunities. An estimated 1,200 fighters have left France to become jihadists in Syria and Iraq, according to the U.K.-based I.C.S.R., which has been tracking fighters in the Iraqi-Syrian conflicts since 2012. More British men have joined Islamic extremist groups abroad than have entered the British armed forces. Ideologically centered recruitment—particularly online and through social media—and discontent with perceived domestic and foreign policies affecting Muslims, are the primary causes of Islamic radicalisation in Western countries, especially where Muslim communities are isolated from others. The sense of alienation, especially among the youth of Muslim immigrants, mixed with antipathy toward their country’s foreign policy makes some Muslims prime targets for foreign recruiters. “Algerian French-Muslim immigrants or South Asian Muslims in the U.K. feel excluded and constantly watched and tracked by the authorities,” said Nakhleh. While surveillance programmes targeting Muslims are also in effect in the U.S.—more than half of the Muslim Americans surveyed by Pew in 2011 said government anti-terrorism policies singled them out for increased surveillance and monitoring—Muslim Americans have not expressed the same level of discontent with their lives as those in Western European countries such as France and the United Kingdom. Indeed, the Muslim Americans surveyed by Pew in 2011 who reported discrimination still expressed a high level of satisfaction with their lives in the United States. Conversely, French Muslims in particular complain of religious intolerance in the generally secular society. The French law banning Islamic face coverings and burqas, which cover the entire body, resulted in a series of angry protests and clashes with police. Muslim groups have also complained of increasing rates of violent attacks since the ban became law in 2010. A nine-month pregnant woman was beaten last month in southern France by two men who tore off her veil, saying “none of that here.” Another Islamophobic attack in 2013 resulted in a French Muslim woman in Paris suffering a miscarriage. But the U.S. government has been working to prevent its Muslim communities from feeling discriminated against and isolated. Throughout his two terms in office, U.S. President Barack Obama has repeatedly distinguished between Islamic extremism and Islam as a religion. “We are not at war with Islam, we are at war with those who have perverted Islam,” said Obama Feb. 18 at the White House-hosted Summit to Counter Violent Extremism. He has also encouraged religious tolerance while calling for Muslim community leaders to work more closely with the government in rooting out homegrown extremism. “Here in America, Islam has been woven into the fabric of our country since its founding,” said Obama. “If we’re going to solve these issues, then the people who are most targeted and potentially most affected — Muslim Americans — have to have a seat at the table where they can help shape and strengthen these partnerships so that we’re all working together to help communities stay safe and strong and resilient,” he said. The Jan. 7 terrorist attack in Paris, where two gunmen executed 11 staffers at the Charlie Hebdo magazine for what they considered deeply offensive portrayals of Islam, have put Western countries on heightened alert for so-called “lone-wolf” attacks, where individuals perpetuate violence to prove a point or for a cause. The U.S. has not seen a similar major terror attack since April 2013, when two Chechnyan-American brothers deployed pressure-cooker bombs at the Boston Marathon, killing three people and injuring hundreds of others. But with sophisticated foreign-terrorist recruitment efforts on the rise, Washington has increased its counter-terrorism measures at home and worldwide. While the Islamic State and similar groups could plan attacks on U.S. soil if they see the U.S. as directly involved in their battles, according to Nakhleh, their primary goal at the moment is to recruit foreigners as combatants. “The more Western Jihadists they can recruit, the more global they can present themselves as they seek allegiances in Asian countries, and in North Africa,” he said.